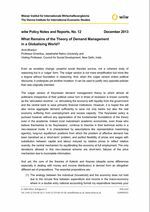 What Remains of the Theory of Demand Management in a Globalising World? The paper explains a curious redirection of economic policies that uses the policy framework of Kalecki and Keynes only to undermine it. It does not negate their theory of demand management, but reformulates it to serve the powerful interests of finance in the era of financial globalisation. As a result accountability to finance rather than to the citizens becomes more important for democratic governments and credit rating dominates democratic performance.